Aside from waiting for infrastructure and action from authorities, what tech advances are out there to help make cycling safer? With bicycle sales on the rise across the UK and predicted to top £900 million by 2018, cycling, it seems, has never been so popular. However, the most recent statistics highlighted by the Royal Society for the Prevention of Accidents (ROSPA) showed that more than 19,000 cyclists were involved in an accident in 2013 – with 109 people killed as a result and about 3,000 suffering serious injuries. About two thirds of non-cyclists say they feel it is too dangerous for them to go out onto the roads. So what’s available to ensure cyclists are safe on the roads? Everyone is aware of tried and tested safety devices such as the helmet, lights and reflectors – and ever more effective versions of these are always coming on to the market – but more and more items are available to enhance the protection that such staple items can offer. The Guardian pinpointed six ways in which newer, smarter technology has come to the fore when it comes to cycle safety. It looked at brighter LEDs that are adorning wheels, sensors that can boost your lights when needed most at junctions, roundabouts or just merging with traffic and a car-style loud horn that can make you heard amidst the din of the rest of the traffic, among other additions that can make riders feel safer on their cycles. Other innovations available include gloves with indicator lights fitted into them and an inflatable bike helmet that acts almost like an airbag – only jumping to action to take effect when it is required. The next stage of the technological development in this field certainly seems to involve integrating the smart technology of our phones and computers and putting them to use in keeping cyclists safe. At the CES 2015 show in January a prototype helmet was unveiled by Volvo. This alerts drivers to the presence of a cyclist in their blind spot or when road visibility is poor using the Scandinavian manufacturer’s City Safety system. It also alerts the cyclist when they are in a vehicle’s blind spot so they can proceed with caution – as well as linking to fitness monitoring apps. 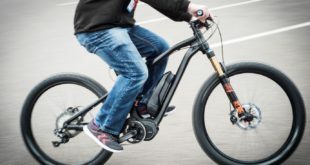 Then there’s the Hammerhead, a device that can attach to the handlebars of a bike and – when connected to an app – act as a turn-by-turn satellite navigation system, helping to safely guide cyclists through their route. Smart handlebars have also been developed to offer a similar navigational help for cyclists who can then concentrate on simply riding safely. We’ve seen how the cyclist can protect themselves, but can the driver also help to stop a collision from occurring? Some cities have taken to installing ‘trixie’ mirrors at the sorts of busy junctions where such collisions are likely to occur. The convex mirrors are attached to – or placed next to – traffic lights and reflect back on that otherwise-unsighted channel next to large vehicles. The mirrors are named after the daughter of inventor Ulrich Willburger, Beatrix, who died aged 13 after being struck by a lorry. In other areas, small poles are being installed to mark out clean lines between where cyclists and motorists travel, in a bid to stop either party drifting into the space occupied by the other. Companies such as Brigade now offer camera systems that can be installed on any vehicle, feeding footage into a monitor that allows the driver to get a full 360-degree view. Such systems can also see sensors and alarms fitted to alert the driver to a potential hazard that they can then monitor using their screen. Scania lorries are also now offering safety kits that can include similar systems, while car manufacturers are also cottoning on to the benefits of all-round vision for drivers – with Jaguar Land Rover using screens on the inside of the pillars in its vehicles to show the driver what is behind them and making them appear ‘invisible’. As technology improves, more and more inventions will help to reduce the chances of the worst happening. It’s not about the blame game, but making sure that a collision is avoided in the first place so that things do not go that far. The more this danger is diminished, the more the barriers to bicycles will be broken down. If there really is a ‘revolution’ under way when it comes to cycling, then safety measures, for both vehicle and cycle, are only going to add further fuel to that.